In Surah Al-Hujurat (49:9), Allah, Al-Raqib (The Watchful), in the first part of this ayat, tells us that we should try to make peace between aggrieved Muslim groups, but if one of the parties is oppressing the other, we should come to the aid of the oppressed and fight the wrongdoer and help peace be re-established with justice. Allah, The Just, loves al-muq’sitina (those who are just). Al-Adalat (Justice) is a fundamental belief in Islam. Everyone understands that oppression is wrong and justice is right. 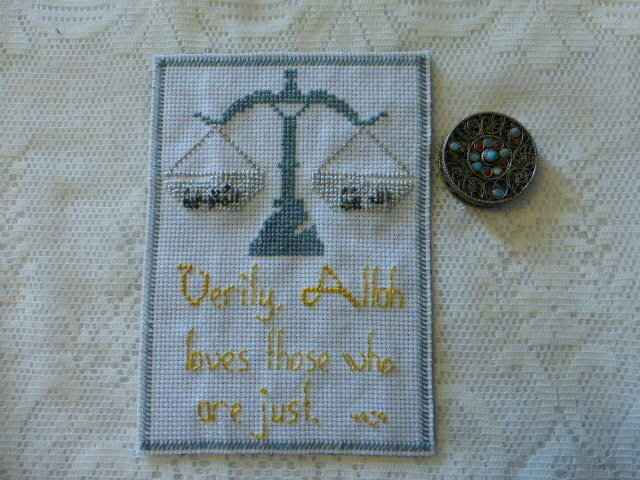 Justice essentially means “to put everything in its place,” being in balance and equilibrium, but it also means “allowing individual’s rights.” The meaning of Allah’s Justice is to neither remove the rights of a person nor give the rights of one person to another nor to discriminate between people. All of Allah’s actions are based on justice and wisdom and we are also commanded to behave the same way.